In yesterday's earnings call from the fourth quarter of 2013, Tesla Motors announced that their net income of $46 million late last year came without selling any Zero Emissions Vehicle credits. That's a pretty big deal, and here's why. While Tesla's fourth quarter sales included $15 million worth of other regulatory credits, Tesla says they made this money without selling ZEV credits at all. If you aren't familiar with ZEV credit trading, the California Air Resources Board essentially gives automakers credits for building green cars, and they can sell those credits to their competitors. Automakers do this because they are required to have a certain number of credits, a number which increases every year. The State of California Zero Emission Vehicle (ZEV) standard requires a certain percentage of an auto maker's California sales to be zero-tailpipe-emission vehicles. For 2014 this requirement is about 1% of sales; the percentage is expected to ramp up to 16% in 2015. In principle, these sales can be either electric vehicles or some other technology such as hydrogen fuel-cell vehicles, but currently electric vehicles are the only real option. If a manufacturer doesn't meet this standard, it must buy zero-emission-vehicle credits from a manufacturer that has a surplus of credits. Tesla, for example, makes only electric vehicles and therefore has a surplus of credits. General Motors was a major buyer of credits in 2013, purchasing over 300 zero-emission credits and over 500 "partial" credits. These numbers will continue to increase as the zero-emission mandate becomes more stringent. Last year, when Tesla delivered their first profitable quarter, they admitted that $68 million worth of revenue that quarter came from selling ZEV credits — about 12 percent of their income. They weren't profitable simply from building cars. In recent years selling ZEV credits became such a major source of revenue for Tesla that some critics accused them of being less a car company and more a ZEV credit sales shop subsidized by other automakers. At the same time, other automakers' need to buy ZEV credits becomes less necessary over time as they add their own hybrid and electric vehicles to their fleet. It's just not a sustainable source of income. Elon Musk knows this; according to Forbes, he announced last year the company would taper off its sales of ZEV credits as 2013 went on. This handy chart shows the decline of ZEV credit sales as margins kept rising. But that faucet may be drying up soon anyway, and it has to do with the Model S's ability to swap its batteries on the fly. 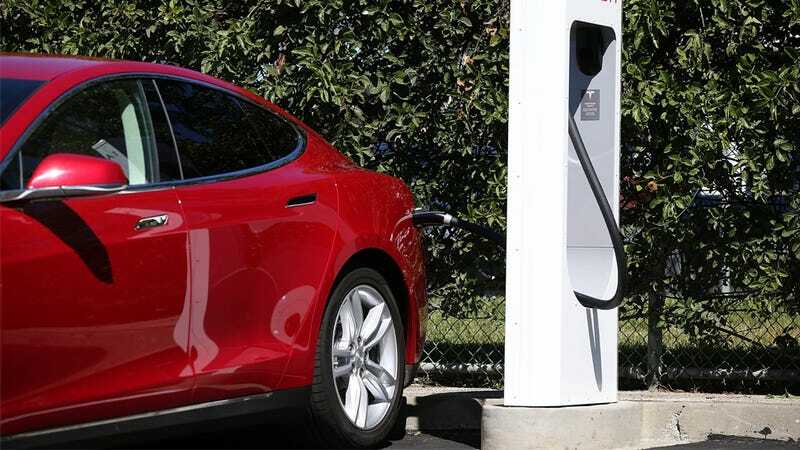 Those battery swap stations don't exist yet, but Musk has said they will be online in California in a few months. The problem is CARB has been evaluating whether or not to eliminate the battery swap rule, and while that hasn't happened yet, it may have hampered one of Tesla's biggest historic income sources. So what can we take away from Tesla's fourth quarter report, which showed a respectable income without ZEV credit sales? It may mean Tesla can stand on their own without depending on credit sales. We think an automotive gross margin of 28%, excluding potential ZEV credit sales, is a reasonable target for Q4 2014, even if a lower option take rate is assumed. Please note that Tesla is not trying to achieve the absolute highest possible gross margin, as this would require following the industry practice of charging excessive prices to customers in certain markets, which we believe is inconsistent with building long term loyalty.